You might have wondered why Manchester United Football Club applied a chevron to their home jersey. 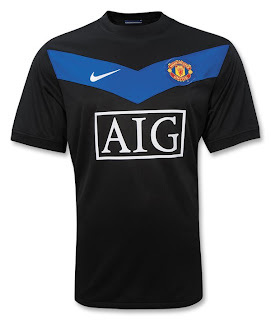 Well, we have the answer, courtesy of the launch of their new Official Nike Manchester United 09/10 Away Soccer Jersey. The shirt is all black, save for the classic chevron design - which honors the kit that Manchester United wore during their first season at Old Trafford - 100 years ago! The chevron, which is the V design, traditionally signifies merit, rank and/or length of service. It is a fitting design for the Premier League champs, as few teams in World Soccer can match their success and tradition, most of which the Red Devils have enjoyed at their home: Old Trafford.